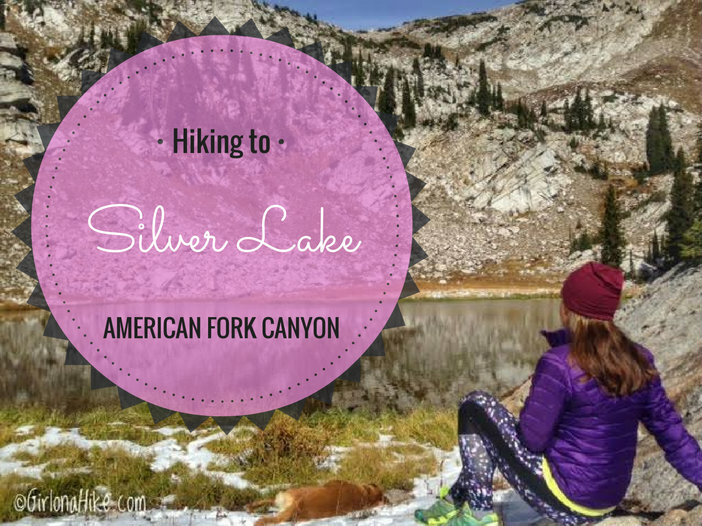 Silver Lake in American Fork Canyon is a beautiful high alpine lake that sits just below the Little Cottonwood Canyon ridgeline on the south side. This moderate trail slowly gains elevation, so it's not super hard to reach this awesome destination. 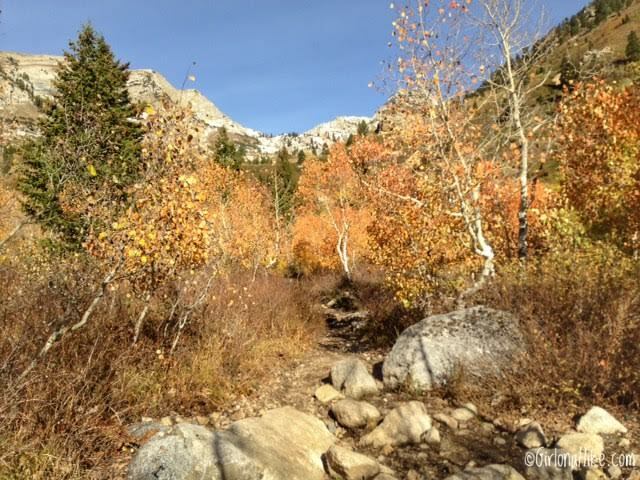 The trail passes by some boulders, crosses a stream, climbs up 3-4 long switchbacks, and finally reaches the lake after only 2.2 miles (one way). 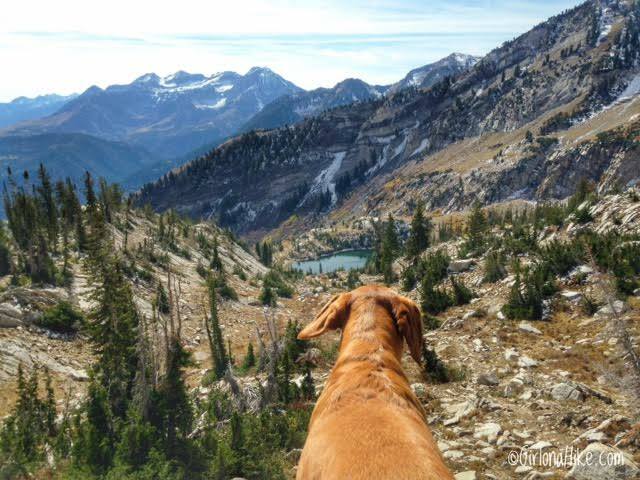 This is a great hike for dogs to be off leash, and there is plenty of water for them to drink from. Bring some snacks, and take in the scenery at Silver Lake, or for those needing some extra mileage, continue on to Silver Glance Lake. 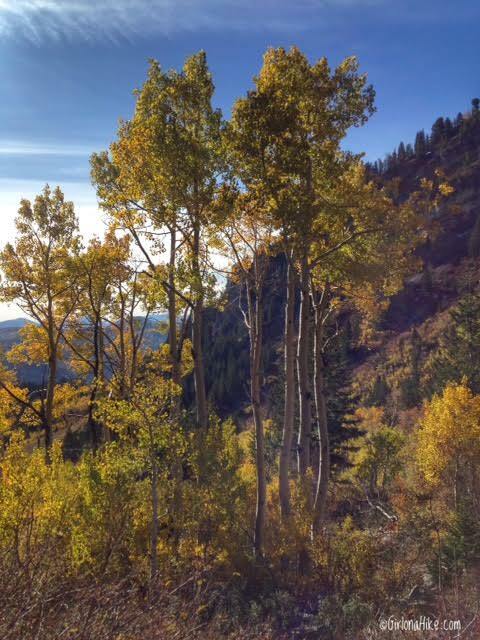 From SLC head south on I-15 and take exit 284 and turn left towards American Fork Canyon. 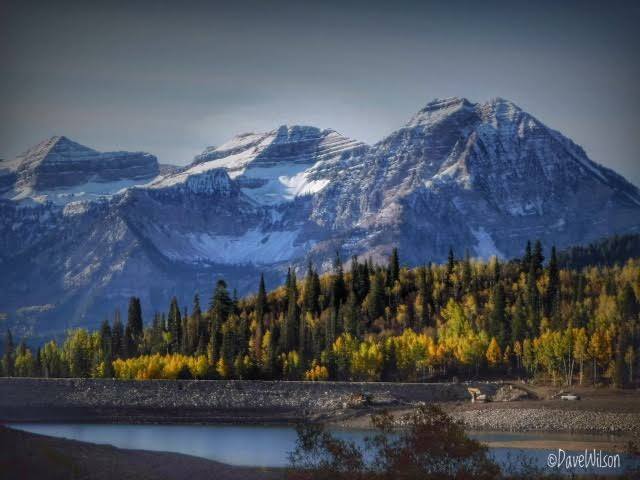 Drive past the fee station, then turn left for Tibble Fork Reservoir. Just after the reservoir, you will make a sharp left turn with a sign for the "Horse Transfer Station" and "Granite Flats Campground". Just before the campground, you will turn right onto the dirt road. Follow this until you reach the large parking lot and the Silver Lake TH. A small, compact car can make this drive, so 4x4 is not needed. There are restrooms at the TH, and parking for about 20-25 cars. I recommend arriving early to beat the crowds and possibly see wildlife. Here's a driving map. Fees/Permits? 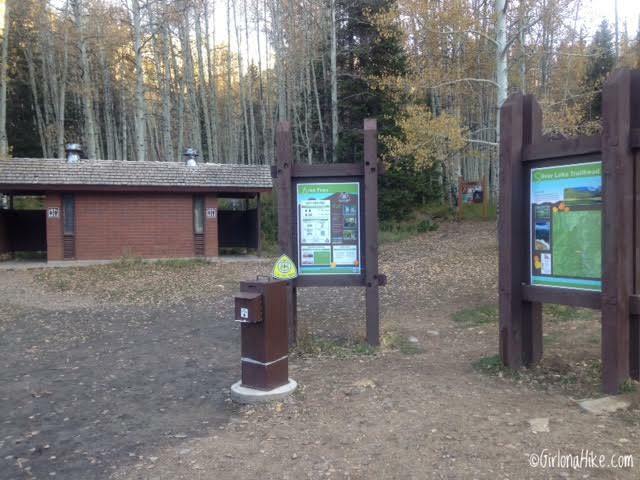 There is a $6 fee to enter AF Canyon. 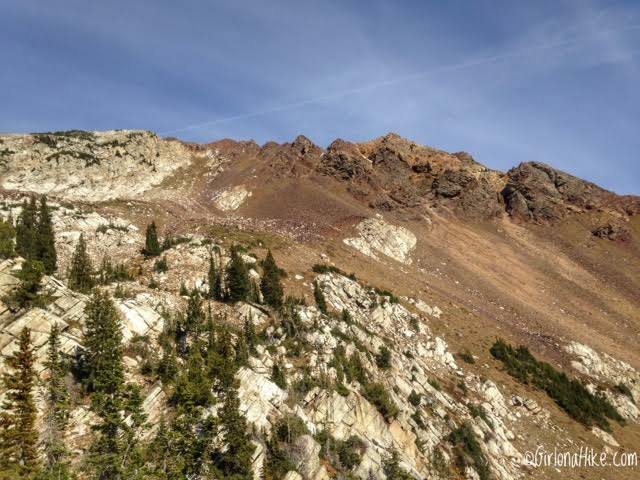 It's FREE if you have an annual AF Canyon Pass or annual National Park Pass. No Permits are required. 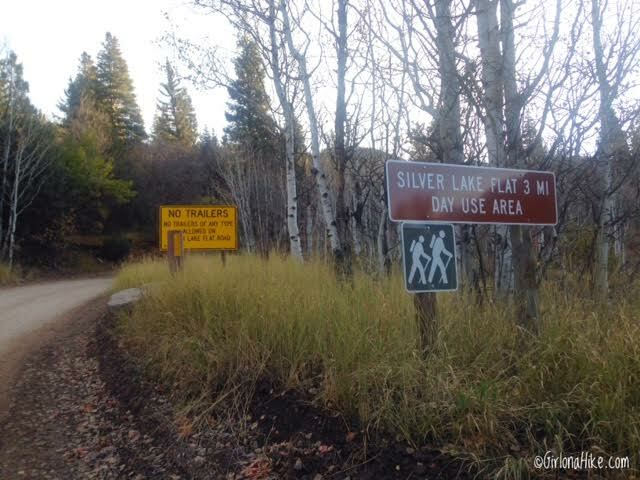 Just before the Granite Flats Campground, you will see the sign for Silver Lake. Turn here and drive until you reach the large parking lot for the TH. This is a narrow, winding, dirt road, so drive carefully. The official TH for Silver Lake and Silver Glance Lake. Looking across Silver Lake Reservoir. What an awesome view of Mt. 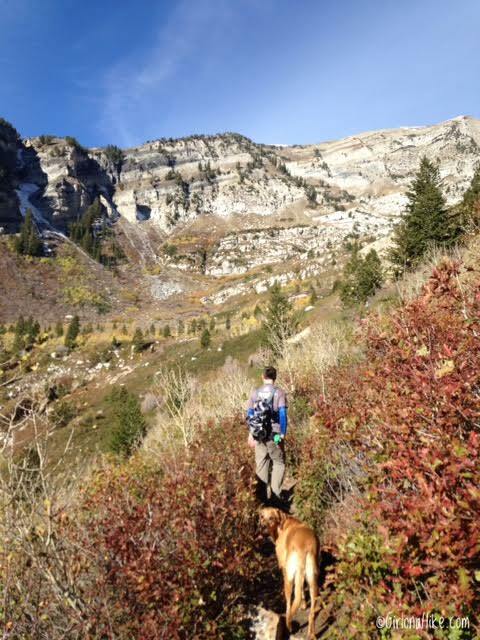 Timpanogos (to the far left). Begin by hiking behind the TH signs, and keep left. Keep in mind that at this elevation, temperatures are a good 10-15F cooler than in the valley. 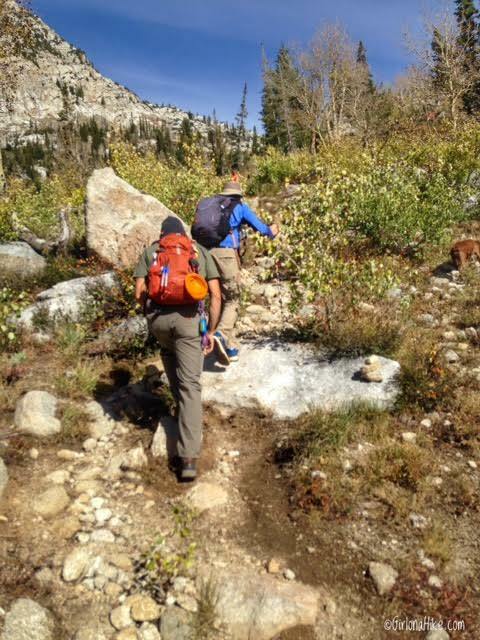 If hiking early in the morning, be sure to bring gloves and a hat. It was cold (28F)! 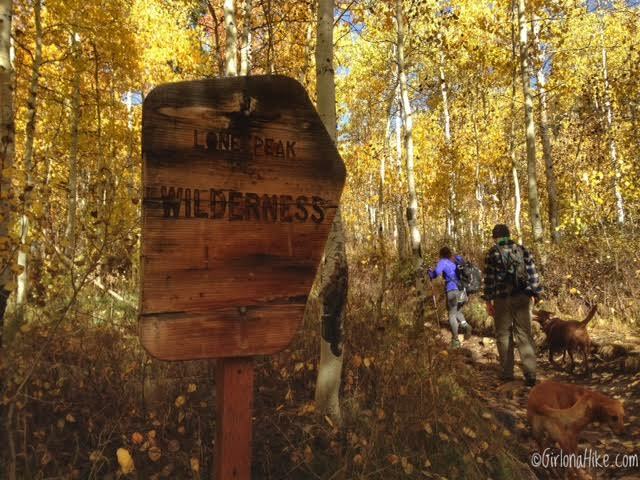 After 5-10 minutes you'll enter the Lone Peak Wilderness! 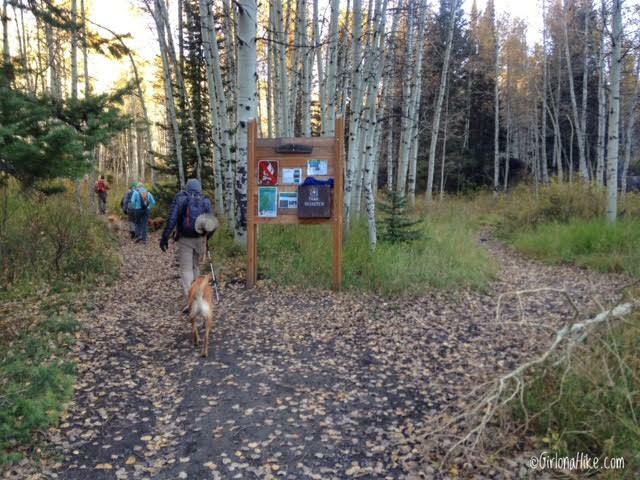 The first part of the trail is very well shaded with beautiful Aspen trees. In Fall, the colors are amazing! The view begins to open up and you can finally see the ridgeline. Silver Lake sits just below the white rock. Cross the stream. In late spring/early summer, this stream can be raging and difficult to cross. 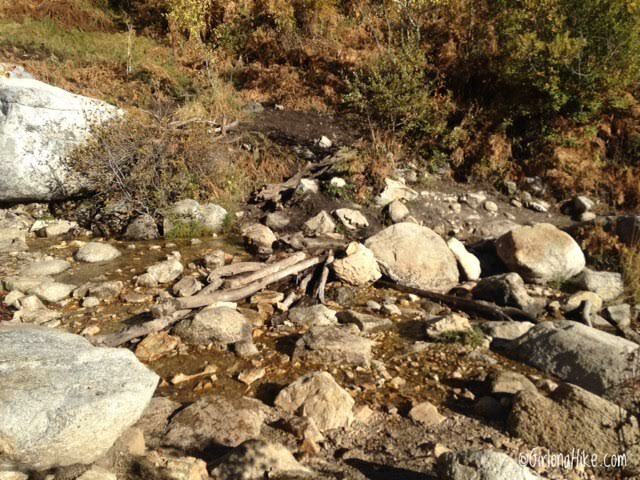 However, since we hiked this in early October, the stream was easy to cross and the water level was very low. This is a good spot to stop with the dogs so they can take a quick break and drink. Once you cross the stream, continue right. 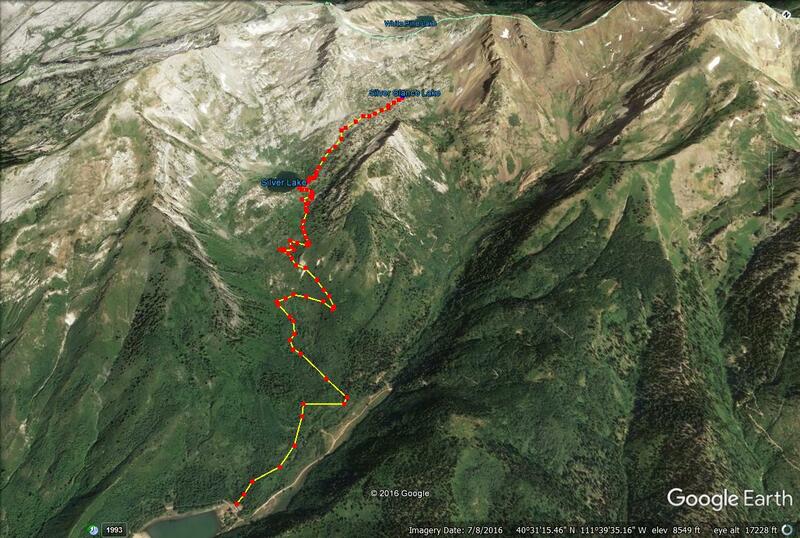 Work your way up several long switchbacks. The fall colors were so pretty! Almost to the lake, the dogs stop to pose for a photo together. There are plenty of spaces to sit and snack and take in the view. If you like to fish, there's good fishing here too. Charlie took advantage of our break, and took a swim in this freezing water. The water is really clear. Group photo! 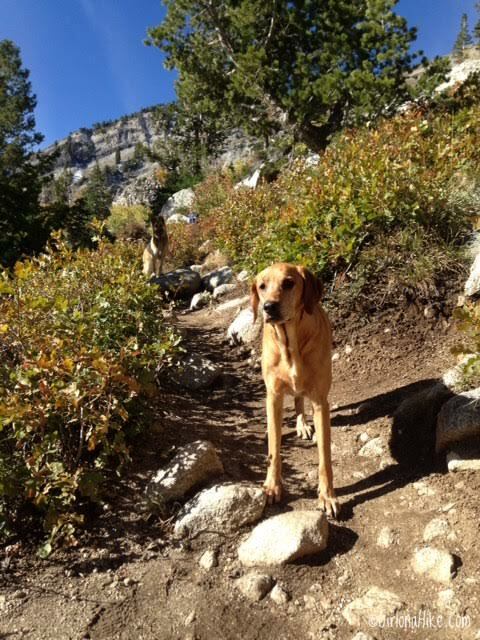 If you have a dog and would like to meet other dog owners who love to hike, be sure to join our group, Hiking in Utah - With our Dogs! 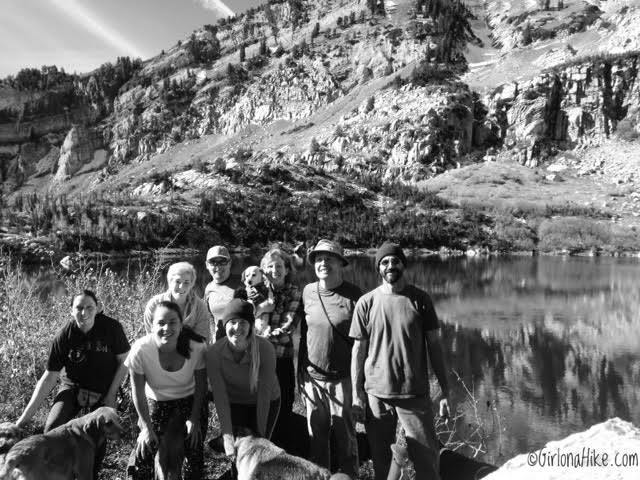 We hike every Tuesday night during from March-September, and in Winter, on weekends. It's free to join! You can also join our Facebook group. This is a great turn around spot for families with kids or older adults. You just take the same trail back down to the cars. Charlie and I needed some extra mileage so we continued up to Silver Glance Lake from here. Taking a breather break on the way up. 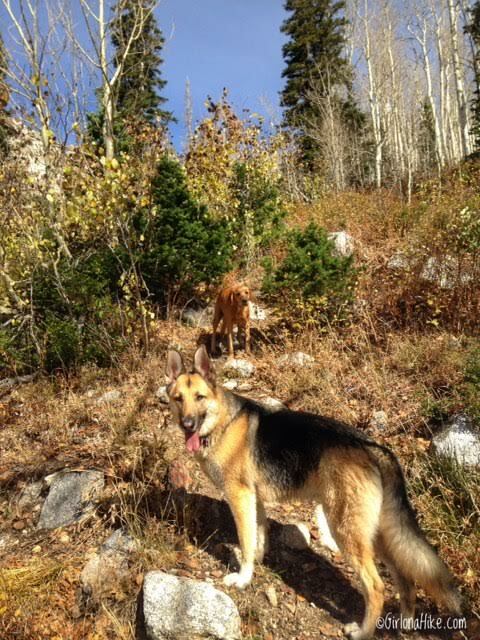 Tallie (a German Sheppard) and Charlie were happy pups! 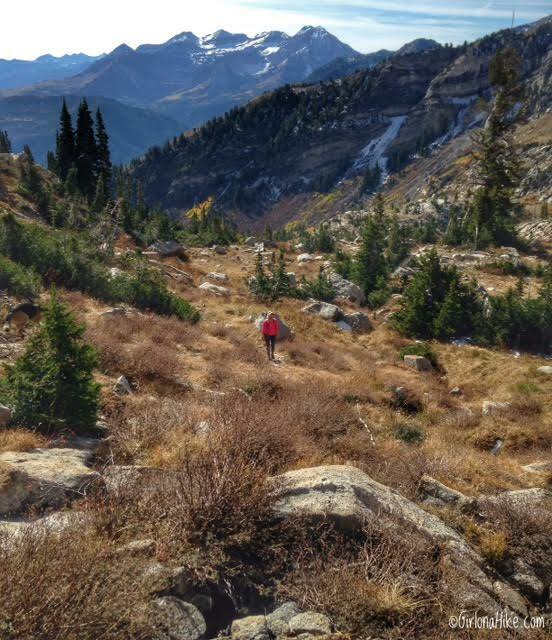 Looking back at my friend @nicole04321 as she works her way up the steep trail. 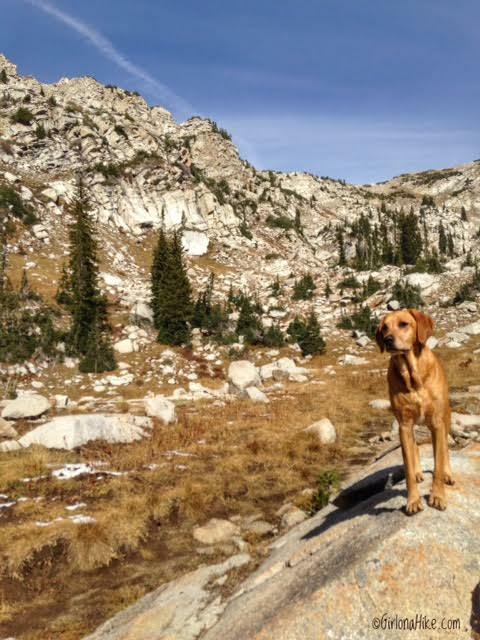 Stopping below White Baldy to pose for a photo. 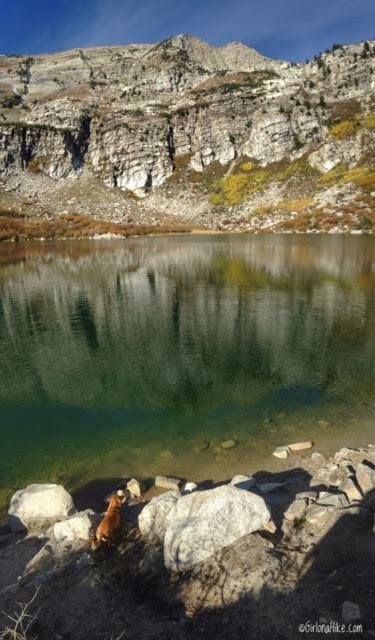 We reached Silver Glance Lake in under 30 minutes. I'm loving my new beanie from Cedar Ravine! Silver Glance lake is much smaller in size compared to Silver Lake, but you'll likely see way less people here. Exploring the area we found a nice little overlook of the canyon. 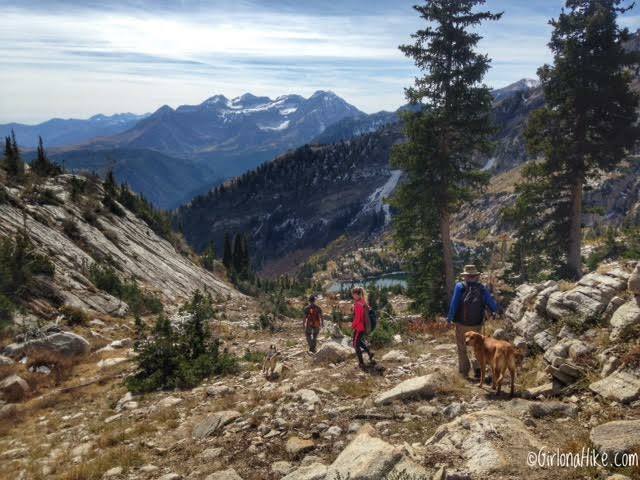 Great view of Red Baldy (another peak on my to-do list)! 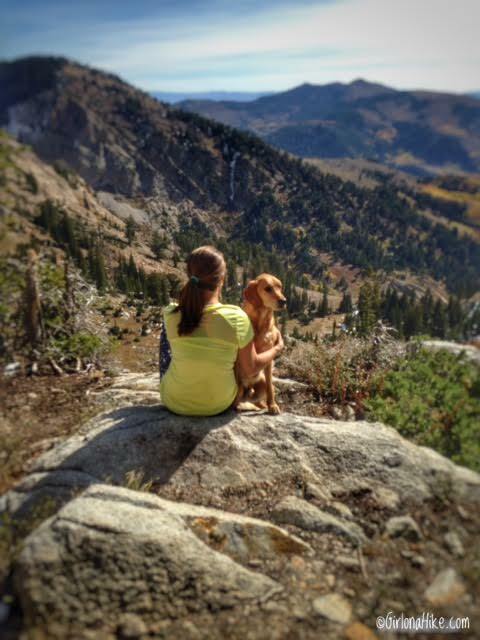 Charlie and I loved the view from this trail. Working our way down the trail. 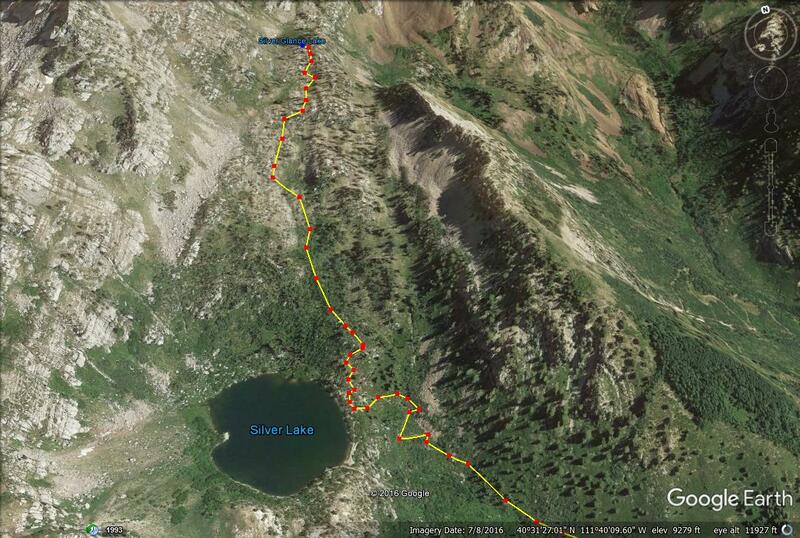 A close up of the trial map from Silver Lake to Silver Glance Lake. Directions: Preheat oven to 350F. Stir all ingredients together. Roll the dough out on a flat surface sprinkled with flour (or between two sheets of parchment paper); roll out to 1/4" thick. Use a cookie cutter to cut out the dough, then place on a cookie sheet. Bake at 350F for 8-10 miutes. 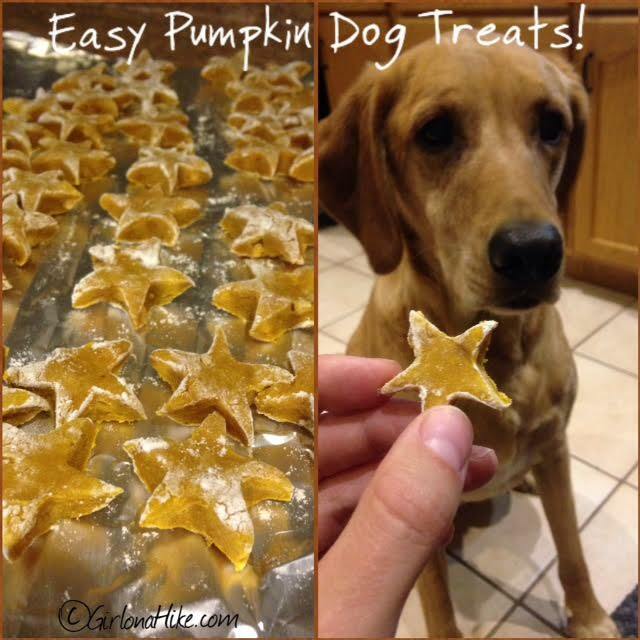 Let cool completely before feeding your dog these treats. These treats can be stored in an air tight container for up to 3 months. I also found that this recipe made A LOT of dough, so I cut it half and put the rest of the dough in a ziplock baggie in the freezer. Now when I'm in the mood to bake for Charlie, I have dough prepared! 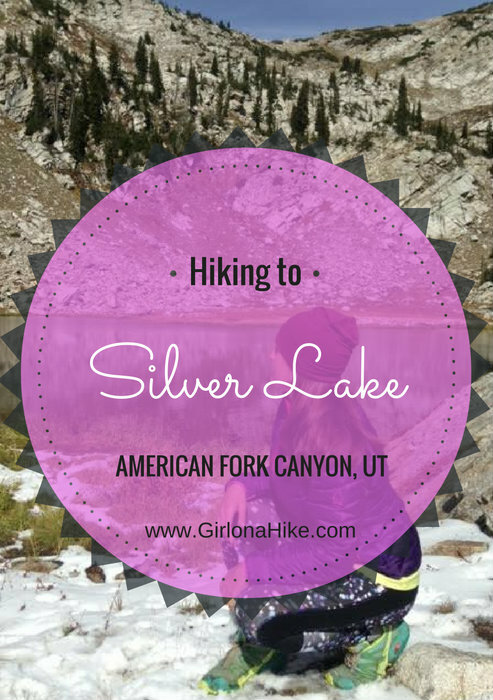 I did this hike in July and loved it! 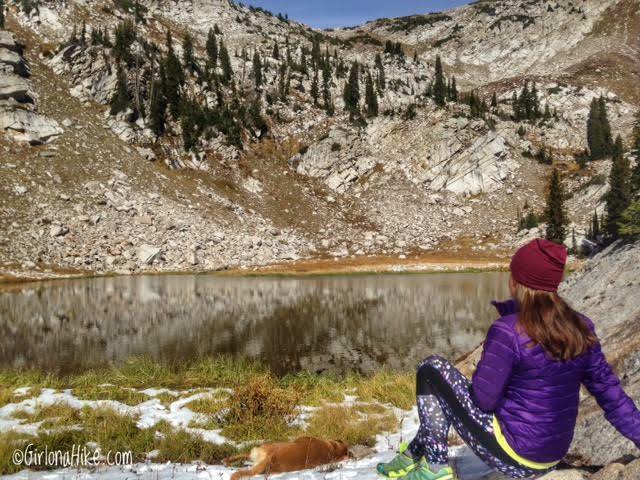 I'm from California and new to winter/snow hiking, is it safe enough to hike during winter?! My pup loves the snow it's me who's a little unsure, thanks!